Hash House A Go Go came highly recommended, and it had been recently awarded a pile of praise from various sources. The San Diego-based chain had been expanding, and the count was 4 Las Vegas establishments at the time of this review. 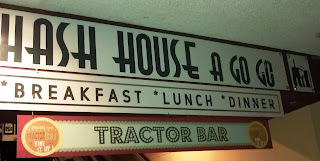 This particular Hash House A Go Go was at The Quad,and specifically it was in the former location of the former buffet of what once was the The Imperial Palace buffet As memory serves, this was one of the more unpleasant spots in Las Vegas. I had been coming to Las Vegas for over 2 decades, and much had changed. Here's how Hash House A Go Go website described what to expect, "...We keep the fun in food while pulling from the experiences of farm fresh agriculture, live stock, and old recipes with a twist. We maintain a level of excitement and entertainment within the dining experience, while ensuring excellent service each and every day..."
Happy Meal and I ordered up a couple of cheeseburgers. Happy Meal ordered a single cheeseburger from the kid's menu, and I ordered an embarrassing one-pound Stuffed Burger. Our meals arrived in about 10 minutes. 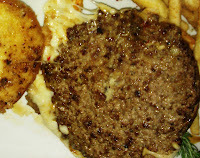 The Beef: The burger was composed of two, big, flat, Well-Done patties. The patties outsized the bun by a long shot. The beef was 100% Certified Angus Chuck delivered pre-ground by Desert Meats. The beefiness was 5 on a scale of 1-10. The funk was present even though the Chuck was not aged. The beef was juicy and not overly oily. The fat content was about 20%. The beef was pressed hard and flat as it cooked.The result was a moderately chewy bite. Honestly, this burger was more of a dare than a meal. I got through 25% of it, and then my sense of self-preservation kicked in--the 10 dollar burger was HUGE. After the meal, I found it surprising that there was not queue of ambulances idling out front....Clear! The Seasoning: I detected a dash of salt on the exterior of my burger patties. The Sear: The sear was delivered courtesy of an Accutemp flat-top. This was the kind of kitchen device that made me believe in wizardry. The griddle sensed the material it was cooking, and it adjusted the heat automatically and only in the spot where the food was located.....Sorcery. The sear itself was nominal. I assumed that a grill weight had been employed. This would have accounted for the steamed appearance of the sear. A crisp, dark sear would have made a lot of sense here. Super Duper in San Francisco, CA pulled off a great sear with similar hardware. The Preparation: Hash House A Go Go cooked the burger patties to Well-Done. The grind was coarse. The patties weren't really formed--they were smashed, and there was nothing wrong with that. The Cheese: No American cheese was to be found in the cheese selection. The Cheddar choice was mild, so I went with the smoked Mozzarella. The deal at Hash House A Go Go was to stuff the various toppings between the patties. The melted Mozzarella was located at the geographical center of my burger, accordingly. The cheese was relatively mild, and there was a lot of it. The Bun: The bun was a bespoke egg bun from an unnamed source. The bun was surprisingly bland. It was oiled on the top, which I hated. Mostly, it was bland. It was only nominally toasted, so the bun at Hash House A Go Go was simply a way to get beef to face. 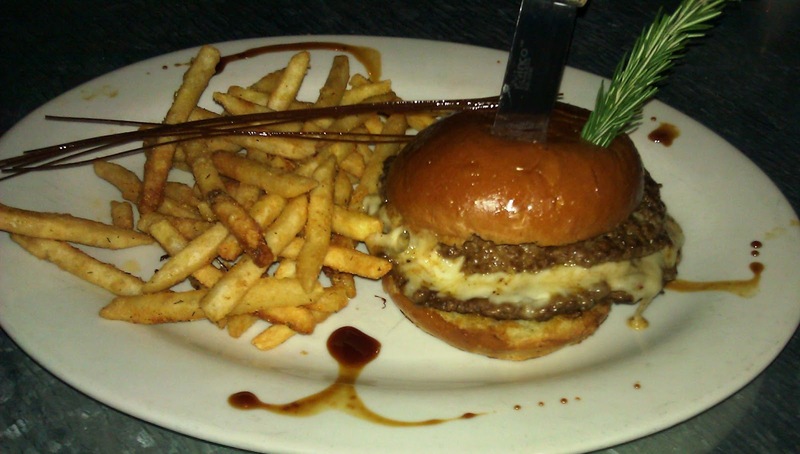 The Meat To Bun Ratio: The bun never had a chance against the mass of ground beef and molten cheese. The Toppings: The tomato and lettuce were both fresh and delicious. The Fries: Perfect. The fries were perfectly coated with steak seasoning, and they were perfectly crisped in canola oil. The creamy centers were outstanding. The fries were a Sysco Foods product, and they arrived bagged, par-cooked, and frozen. The Value: The value at Hash House A Go Go was stupendous. $9.95 for more burger that two people should consume in one sitting was more than generous. Hash House A Go Go specialized in big (nutty) portions of classic Mid-Western fare. The cheeseburgers were not particularly exciting but they were true to the form. 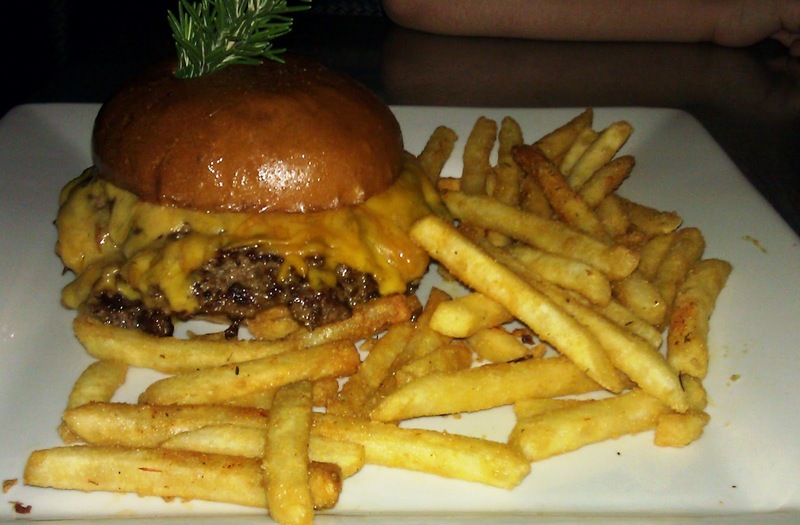 Burger Review : Massive portions of above average chow at an amazing price.